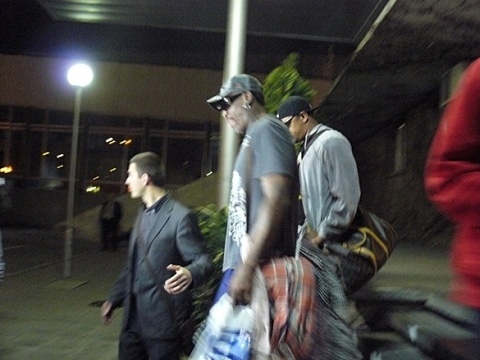 Eccentric US NBA legend, Dennis Rodman, has arrived in Bulgaria late Wednesday evening. He is expected to become the biggest attraction of the country's all-star basketball game scheduled for April 7. Dennis Rodman turned 50 last summer and is still one of NBA's emblematic figures. Even though his playing career ended years ago, his eccentricity still makes him sought after at such events. Dennis Rodman led the NBA in rebounds per game for a record seven consecutive years and won five NBA championships. Lithuanian legend Arvydas Sabonis is also very likely to attend the event, according to dnevnik.bg. Sabonis has health problems, but is expected to arrive in Sofia if he recovers by April 7. The all-star game will take place Saturday at the Sofia brand new sports facility "Arena Armeets." "This is the event of the century for Bulgaria's basketball. Not because of the money, but since it would be a step forward in this sport's development in the country," commented Stefan Avgustinov, manager of Sportlab, the company that is organizing the all-star show.